The new greenhouse fluorinated REFRIGERANT TABLE is now available with the special tax that will apply next September 1st, 2018. The tax rate will consist of the result of applying the 0.015 coefficient to the global warming potential corresponding to each fluorinated gas, with a maximum of 100€ per kg, according to the headings in article 79. Tax rate. Section 5 Tax on fluorinated greenhouse gases of the aforementioned General Budgets. In the case of refrigerants recycled and regenerated to the tax corresponding to virgin products, a reduction of 50% will be applied. 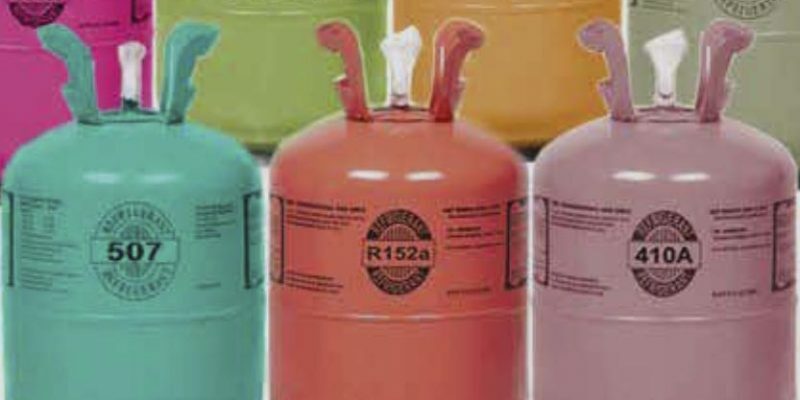 According to Article 5 SIX 2 of Law 16/13 refrigerants with a PCA equal to or less than 150 are not subject. 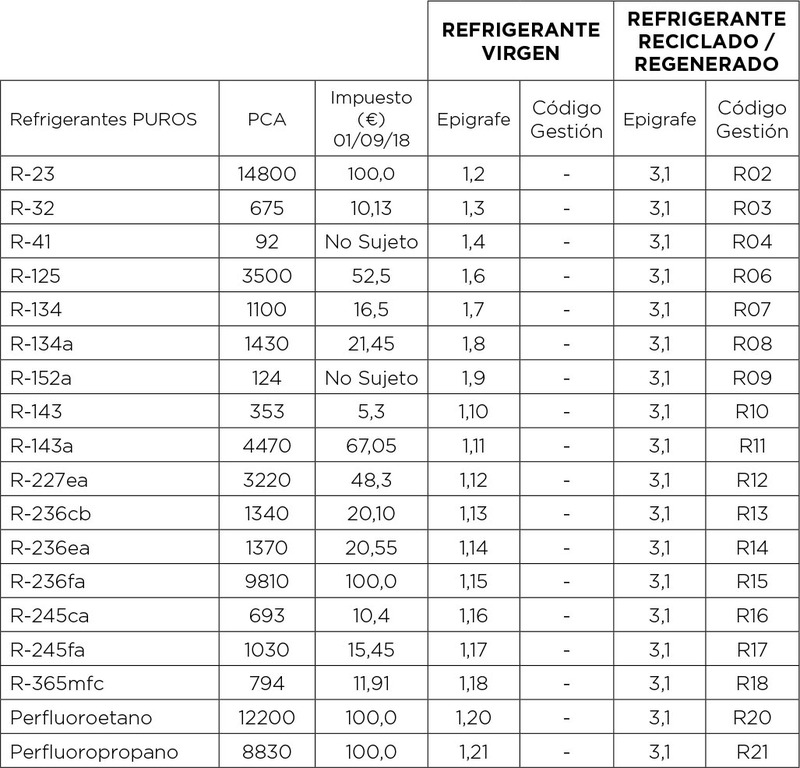 This does not prevent that, if they are part of a preparation with a PCA higher than 150, refrigerants with a PCA equal to or less than 150 are subject in the proportion in which they participate in the preparation. 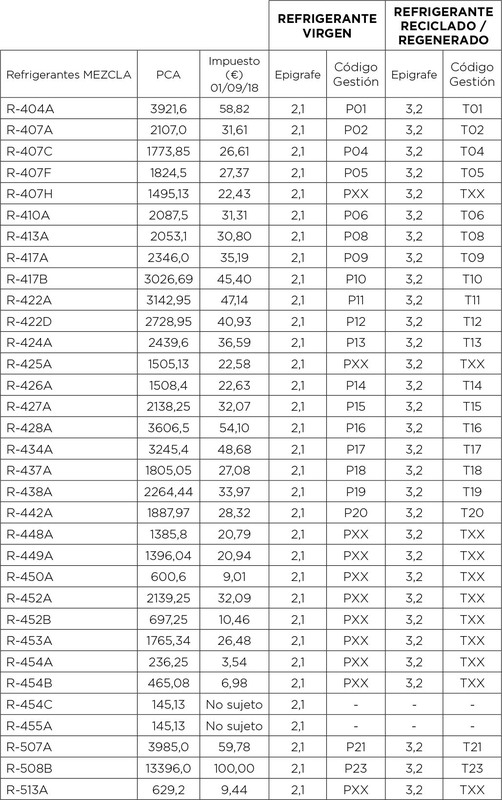 According to the explanation of Special Taxes, refrigerants with PCA equal to or less than 150 that are subject in the proportion in which they participate in the preparation (with PCA greater than 150) are only those listed in the headings listed in the aforementioned article 79.